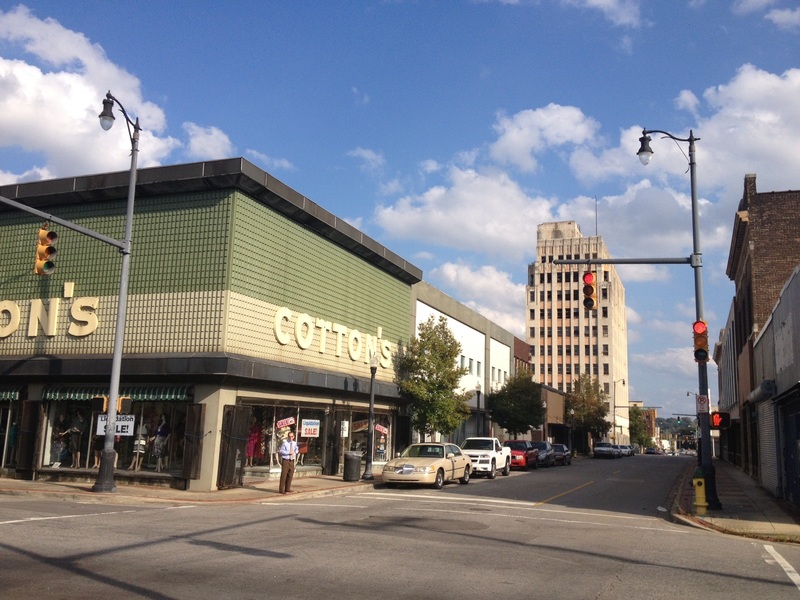 The recent report in the Birmingham News that Cotton’s department store in downtown Ensley is closing after 90 years of business gives us the chance to think about Ensley’s downtown district and its future (19th Street at Avenue F looking west, above). A reminder of Birmingham’s industrial boom, the historic district was once a thriving node of commerce, entertainment, and business in the western part of the City. Its scale and density startles the visitor today: not only was it the center of a neighborhood of more than 20,000 people, but others from surrounding neighborhoods would visit to shop, dine, or attend a show. That all of this could flourish in a place only 7 miles out from Birmingham’s city center testifies to the population base that was thickly spread within the city limits decades ago. 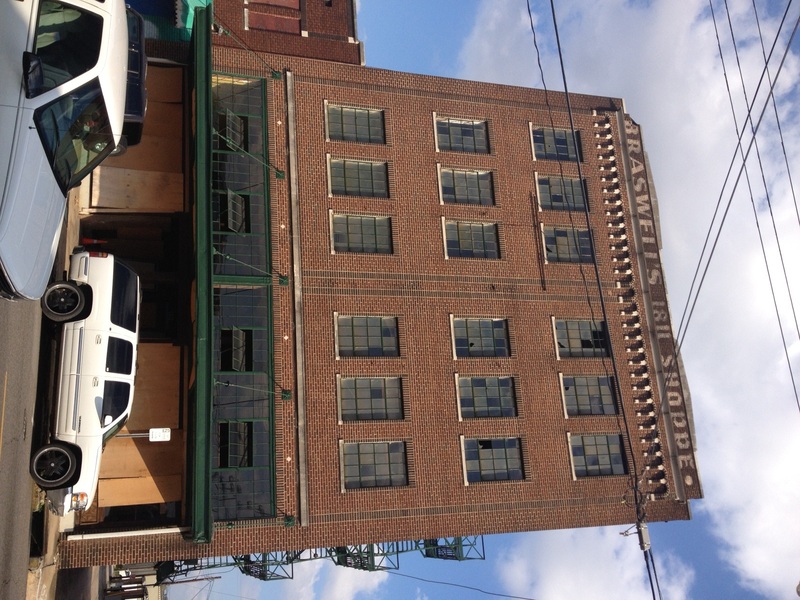 The former Birmingham-Ensley Land Company headquarters building (above at 19th Street and Avenue H) architecturally symbolizes the confidence real estate developers had in the area in the 1920’s, when the Ensley Works were producing steel at full blast and employed thousands of workers. Today, more than 30 years after the last steel plant closed, less than 4000 people inhabit the neighborhood. This statistic, and similar ones in surrounding neighborhoods, means a commercial district designed for a much larger population now serves a much shrunken one. Despite its surface charm, no new paradigm has arrived to help fill the storefronts. 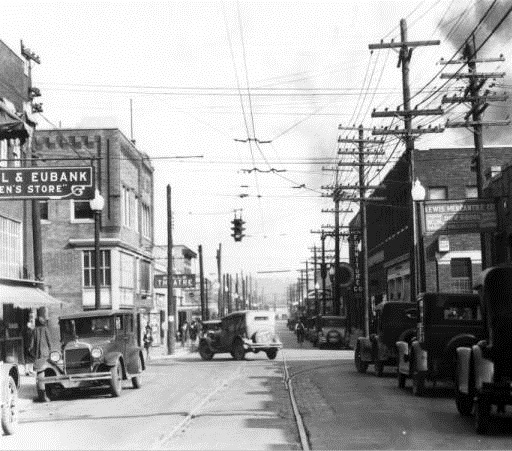 Part of the charm of downtown Ensley is the relative narrowness of certain streets, like 19th Street seen above in the early 1920’s; note the streetcar tracks which allowed people to move between Ensley, adjacent neighborhoods, and central Birmingham and beyond. The streetcars stopped in the 1950’s in conjunction with the spread of car culture across this country. Suburban flight and decline of heavy industry hollowed out much of Birmingham proper. 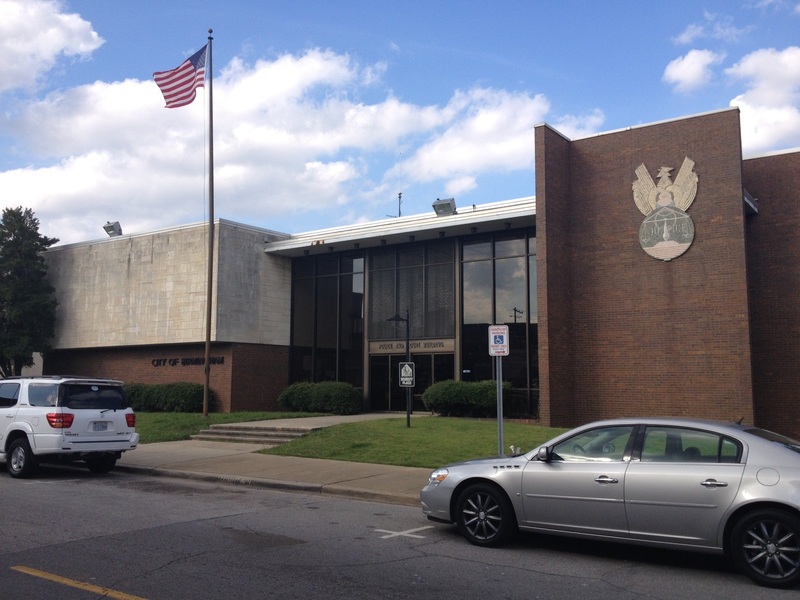 The West Precinct of the City of Birmingham Police Department (above, 19th Street and Avenue G)–while architecturally a creature of the 1960’s with its suburban-style setback and sculptural massing–is in scale and expense a reminder of the importance of Ensley as a hub of the City’s west side. Unfortunately this west side has seen its share of problems with crime over the ensuing decades. While much of this issue has improved, the perception still lingers, which of course can be equally as challenging for any neighborhood. For a myriad of reasons, one by one many of the buildings in this district have lost their occupants. While the 10-story Ramsay-McCormick Building is perhaps the most famous empty building in the district, many other significant structures also cry out for new purpose (above, commercial structure at Avenue F between 19th and 18th Streets). Some buildings in the district have found new purpose: the Volcano ‘gentleman’s club” (above on 19th Street between Avenues E and F) is an adult entertainment complex that joins a few other nightclubs, beauty salons, barber shops, and churches that have filled some of the buildings. This is hardly a recipe for a vibrant district of course. A more diverse mix is needed. 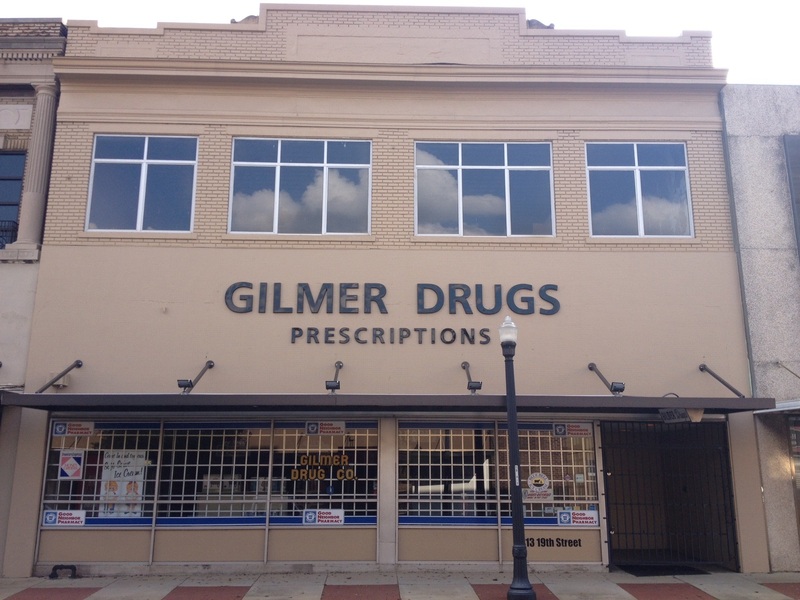 One long-time business that remains is Gilmer Drug Company (above, 19th Street between Avenues D and E), which although its posted hours declared it open on a Saturday afternoon, nevertheless appeared shut. Not a great sign for ongoing viability of any business. This brings us to Cotton’s (above, looking east on 19th Street from Avenue D). 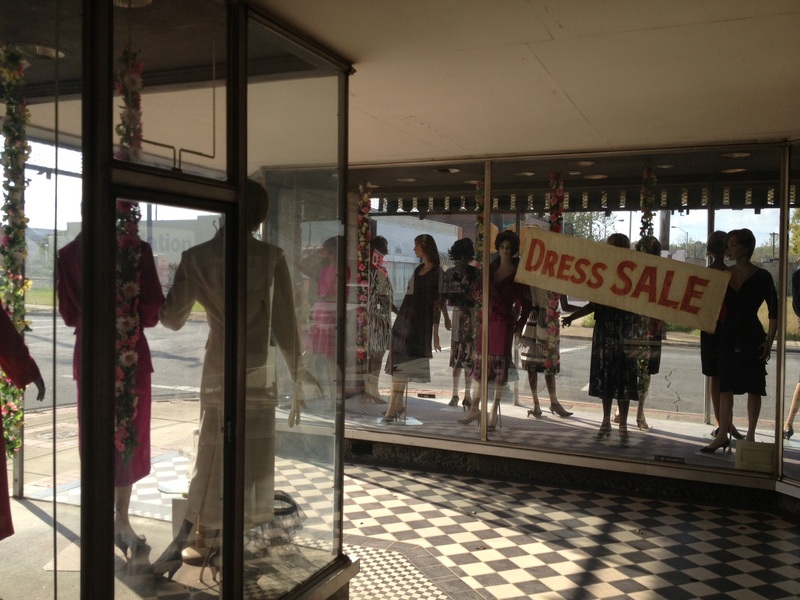 This somewhat old-fashioned, family-run “clothing department store” is the last retailer of note in the district. While sad it’s closing after 90 years of service to Ensley, we should be grateful they managed to hang on as long as they did. They used to be in the middle of other retailers, theaters, offices, restaurants. When all those fell away, Cotton’s remained, supported by a loyal clientele that continued to shop there even if they no longer lived close by. For anyone interested in the history of retail and shop windows, it’s worth traveling to Cotton’s before it closes just to see the fantastic shop windows (above), that are arranged around a U-shaped outdoor passage so that you can “window shop” from dozens of different angles. This type of display was once common in downtown Birmingham and across the country, but it’s very rare to see one survive today. The mannequins, the spatial quality, the views all add up to an urban experience that was once commonplace, and is now virtually lost. Not just here, but anywhere. Whither Ensley? 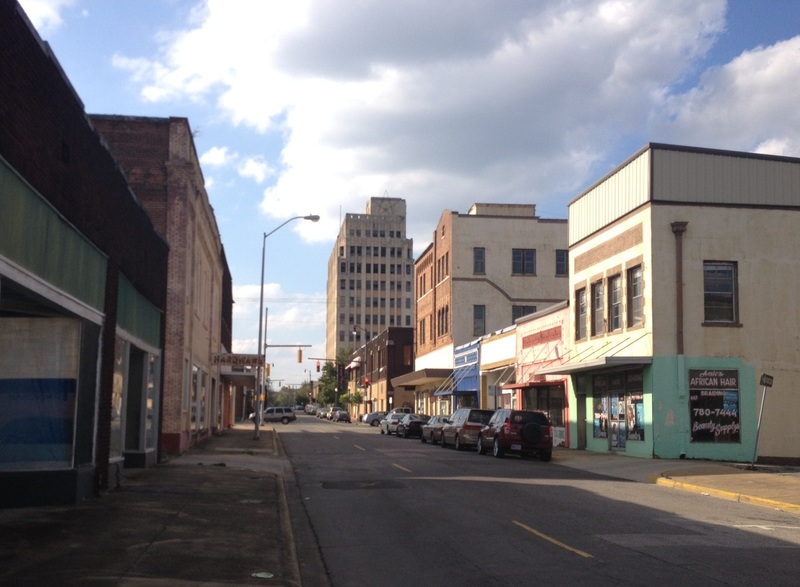 Organizations such as Main Street Birmingham have worked hard to identify possible rejuvenations; the new Birmingham Comprehensive Plan highlights Ensley (and the massive amount of adjacent, formerly industrial property) as a focus area. But time is working against us. The Ramsay-McCormick building, in its art-deco glory, stands open to the elements. Building after building along 19th Street is endangered structurally–and some have already succumbed: above on 19th Street and Avenue G all that remains of a historic structure is the steel frame of its storefront. Other entire blocks have been demolished and sit gathering weeds. So many other cities would kill to have this sort of authentic urban environment within their limits. I hope we can figure out a way to make this district thrive once again. 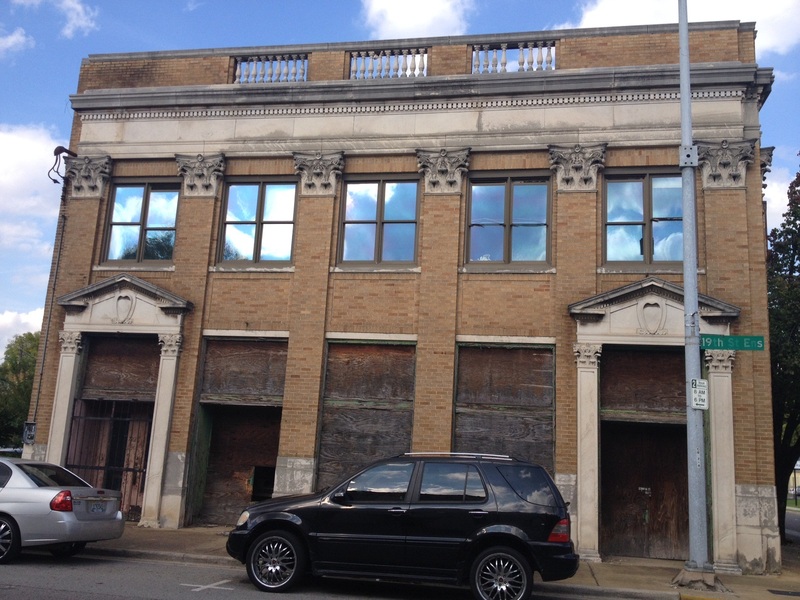 This entry was posted in Uncategorized and tagged Birmingham Comprehensive Plan., Cotton's Department Store, Downtown Ensley, Gilmer Drugs, Main Street Birmingham, Ramsay-McCormick Building. Bookmark the permalink. I thoroughly enjoyed your blog entry on Ensley. My great grandfather and grandfather practiced dentistry in the Ramsay-McCormick building almost from opening until closing. I have very fond memories of roaming the streets of Ensley as a child in the 60’s and 70’s. I share your hope that the area can be revitalized. Thanks for reading. I find it interesting that the Ramsay-McCormick, from what I understand, opened right before the Depression hit and was never 100% occupied. I wish I’d known Ensley myself as a child, but am glad to hear others’ memories as a substitute. Good article on Ensley. Sad to see such neglect and deterioration. All the work and money that went into building Ensley, and it was only used by a few generations before abandonment. Realistically though, I don’t see how all of the built environment can be preserved and used when Birmingham only has 2/3rds the population that built this city. Exactly. It’s fascinating–and sobering–to realize how quickly Ensley was built up, and then how few years it actually thrived. It would never have gotten as big as it did without the population to support it. This neighborhood has shrunk at a much larger rate than the City as a whole, compounding the problem of repopulation. Perhaps there is an interim solution where some way is found to stabilize what’s there and preserve it for future use. It just takes money and commitment–and some confidence that the potential for future use is indeed there. Thanks. How is the pedestrian bridge coming along? Has there been any progress? Do you think funds from the voter approved $150 million will contribute to the bridge? I hope the pedestrian bridge is coming along fine because I believe the Railroad Park/Regions Field/UAB area is about to take off in the next 2 years. If UAB gets its football stadium approved with the next year and expands its Green towards Regions Field, I think it would really accelerate development. What other projects are in the works in that area? We’ve completed the feasibility study for the bridge; I can’t really comment further on it until it’s presented to the City Council, which is the next step in the process. Generally I share your hope: the bridge, along with the network of “complete streets” and bike routes to be constructed starting next year, and the proposed greenway from RR Park towards Sloss, will all help support continued development in that area. Not to mention what UAB may construct on their side of the ballpark. As to other developments, a number of mixed-use and entertainment type projects are being looked at right now. All I know are rumors, nothing firm enough to publish. When things firm up, you’ll read about it here. Thanks. Thank you so much for this article. This is my family’s store and I know my folks will appreciate your analysis of the shop windows. I can remember on so many occasions coming down and seeing my dad in the window spending so much time on the displays. We are a bit overwhelmed right now and as a 4th generation of Cotton’s I am heartbroken that we cannot continue the legacy in this location. You are welcome, and please extend my thanks to your family for all the years of service they’ve given to Ensley. The transition after so many generations must indeed be overwhelming. We don’t know yet what the future of downtown Ensley may be, but I hope that it will in some way recognize the contributions of businesses like Cotton’s that built the place. And I was truly dumbstruck by the shop windows: there are so many “ghosts” of that same type layout in downtown Birmingham that have been covered over or altered. To see one that’s not only intact, but filled with displays, was amazing. Whatever plan is put in place will depend on a lot of creativity, and answering the question of “how to get people here”. Fundamental, but very challenging…Thanks. I’m kind of a fan of easy grid Alphabet naming. It’s much easier to give directions although I guess with GPS so commonplace on our smartphones not as much of an issue. But it was always easy to tell folks just keep coming down 19th Street till you hit Avenue D.
New York City is perhaps the most famous example of easy grid naming–in this case numbers. That such a banal numbered grid can result in such a diverse, vibrant urban environment is fascinating. There can certainly be a beauty to a generic grid. On the other hand, if some of the streets originally had different names, it would also be interesting to at least explore that. An example is the main commercial street of Avondale–41st Street–which used to be Spring Street before it was absorbed into the greater city grid. Going back to that original name could make a lot of sense there. Thanks. 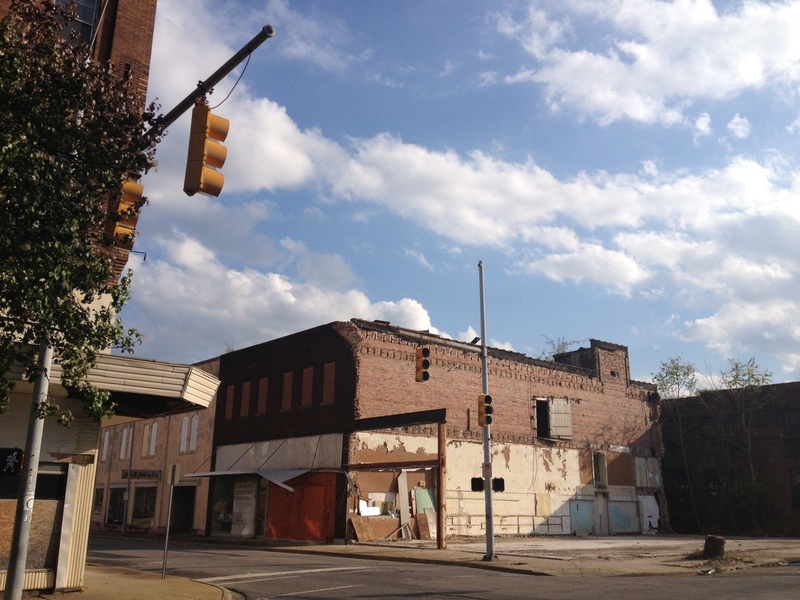 I was in downtown Gary, Indiana briefly this past July and I was amazed at the similarity between it and downtown Ensley. Both had huge US Steel plants that were once the center of their town’s economies. They were about the same physical size with a handful of buildings above 3 stories. Both are in about the same general condition today. Sounds like a very apt comparison. Of course, Gary is an independent city (Ensley was the same before being annexed into Birmingham in 1910), which gives it more control over its own fate. Not that Gary’s economic and demographic context makes anything easier… Thanks. what are your thoughts on the Ramsay McCormick Building? should money be spent for stabilization or should it be torn down? This building should absolutely be stabilized and marketed for redevelopment. 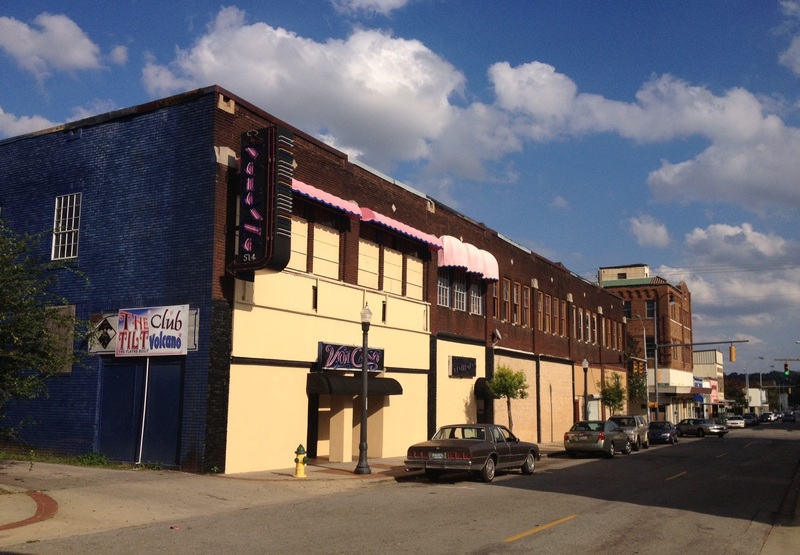 It’s a landmark historic property and without it, we’d lose a huge symbol of Ensley’s heyday. While it will be a challenge to redevelop, I’d much prefer that challenge to another empty, weedy lot or a piece of asphalt parking.